Whichever hat, err … bandana W. Axl Rose is wearing — that of artist, singer, songwriter, stage performer or band leader — he thrives on being at the center of his own riotous spectacle. Rose is an original rock ‘n’ roll diva. If history teaches us anything about this notoriously volatile frontman, it’s that Rose isn’t afraid to kick up a stink no matter the backlash he might unleash. 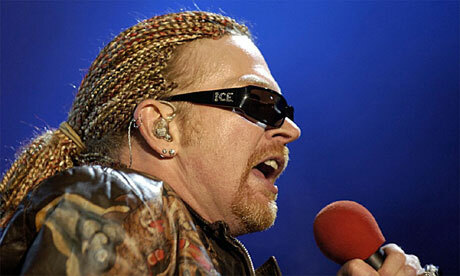 His career as the mainstay of Los Angeles hard-rock outfit Guns N’ Roses reads like a industry bad boy’s wrap sheet. Even the most ultra-sympathetic fans would likely admit his string of offenses demonstrate a repeating pattern of self-sabotage with pronounced appetite for destruction. Among his most egregious blunders include driving all his band members from the group, canceling several performances at the last minute and sparking more than a handful of riots. But perhaps most bizarre of all is how it has taken Rose nearly 15 years and reportedly millions of dollars of record label dough to release a new album under the Guns N’ Roses banner. What has remained Rose’s saving grace through his many self-engineered catastrophes is the music. Any negative aspects — the lyrics with racial slurs or the roughhousing with audience members — were just an ugly part of the package. Despite all of his prima donna antics, the old Guns N’ Roses were a ferocious live unit whose best songs viscerally embodied the rebellious spirit that rock music strives to give voice to. Such was the group’s explosive chemistry of personalities and artistic sensibilities that they were arguably pop rock’s last truly dangerous performers when they got on that stage. There’s little about “Chinese Democracy” that hints of danger. This is a disc that, track by track, suggests laborious design and headstrong decision-making. The record is a bloated, overproduced compilation of futuro-metal epics. It has the sonic aggressiveness, bristling intensity and instrumental muscle to bowl over Rose’s much-abused fans, but ultimately lacks the creative verve that so jolted the rock world nearly 20 years ago this past summer. As nearly everyone knows by now, this isn’t the Guns N’ Roses of old back together again, nor is it another hair-metal installment from the underbelly of the Sunset Strip scene. Rose’s erstwhile bandmates are on the sidelines for this one. Guitarist Izzy Stradlin — the original lineup’s primary songwriter — is still apparently in Indiana exile after quitting the group at the height of its early ’90s, fat Elvis period. The rest of the troupe, including guitarist Slash and bassist Duff McKagan, tried to resurrect their star status with the super-slick supergroup Velvet Revolver and are now trying to kick their addiction to another unstable singer, Scott Weiland. This Guns N’ Roses is essentially Rose’s vanity project run amuck. (Egotistical in the sense that Rose thinks his grating howl is what entitles him to call this pack of session players Guns N’ Roses). The singer himself has acknowledged the herculean task that he set for himself. “How do you make a whole bunch of guys into something that already was,” Rose cryptically asked of MTV’s Kurt Loder when he was questioned about the much-delayed album. This mini-interview occurred backstage when this incarnation of Guns temporarily reemerged from studio purgatory for the 2002 MTV Music Video Awards. Some six years later and after still more lineup changes, more recording and re-recording and some sporadic touring, Rose finally thinks he has the answer committed to vinyl. Besides Roses, keyboardist Dizzy Reed — a holdover from the “Use Your Illusion” era — is the only one who has any connection to Slash and Duff. To fill out the group, Roses has over the years retained and burned through a surprising list of musicians with notable pedigrees from other combos. The lineup now consists of ex-Replacements bassist Tommy Stinson and guitar ace Ron “Bumblefoot” Thal as well as sometime sidemen from the Psychedelic Furs and Tool. Among those ultimately cast aside during the recording marathon were former members of A Perfect Circle, Primus, Nine Inch Nails and the ignominious axe-shredder Buckethead. (Rumors had Ozzy Osbourne’s lieutenant Zakk Wylde, Queen’s Brian May, Jane’s Addiction/Red Hot Chili Peppers’ Dave Navarro all appearing in the studio with the group at one time.) And we haven’t even listed the dozen or more producers who apparently babysat Rose and company. Unlike the old days, no one should fear a Guns N’ Roses concert now unless you’re freaked out by middle-aged men behaving badly. Before, a Guns show was like seeing a gritty, boozing horde of hellions who’d rock your ears off for a couple of hours and before fleeing town with your girlfriend. This Guns charade is about a pampered rock star, with his lackeys in tow, permitted to go to authoritarian extremes. Shared songwriting credits can’t hide who is calling the shots. Rose is again welcoming listeners to the jungle, but this one isn’t a vision of ’80s urban blight. It’s the tangle of impenetrable overdubs and over-the-top guitar glitz. Instead of recapturing a musical zeitgeist, he wants to show his genius by oppressing listeners with too many thick layers of sound. Each of the record’s 14 songs is a complicated, multi-faceted behemoth that seems to endure far longer than their 5 minute or so running time. All of the years of work have allowed Rose to saddle each cut with too many ideas and not enough killer hooks for listeners to hang around for. On the most basic level, a majority of the tracks breeze by without leaving something to hum along to. Instead, we’re supposed to just sit back and marvel at how pissed off Axl still sounds or wonder whether it’s Buckethead or Bumblefoot whose tearing his guitar a new one on this ditty. The album’s title track is an example of this folly. It has a sexed-up rhythm, torn apart by serrated guitar riffs and laced round and round by a pair of scarifying solos. It stalls out though because it’s insufferably bombastic primarily as a way to hide the fact that it doesn’t have any original musical ideas behind it. Rough-hewn guitar licks don’t always make a great melody. The sound effect explosion at the song’s conclusion is all the hot air blasting out of the tune. The album is all over map stylistically but always pretentious. “If The World” has a seductive, Fiona Apple-ish drumbeat that’s partnered with slinky guitar grunts and Rose caterwauling like the he’s the Bee Gee’s Hoosier hick relative. By contrast, “Riad N’ The Bedouins” is what we might expect from Guns 2.0. It’s a pop-metal Panzer charge that buries eardrums in a stack of guitar lines, its connection to industrial music becoming increasingly pronounced as it drives toward the end. This influence is most explicit on “Shackler’s Revenge,” which got its debut on the latest installment of the “Guitar Hero” video game series. The track is the industrial/Alice Cooper mashup that many feared Rose was leading the band toward in the late ’90s. The cut begins as a Rob Zombie-esque horror-rocker that morphs into a manic, multi-layered tumble with a mechanical disco beat. A dozen or so Rose vocal tracks of varying pitch and rage fight for dominance, making it seem like he’s a guest on his own track. Rose’s heavily processed vocal attack is the only anchor to the band’s legacy and the singer consistently wants to distort those linkages. He sounds like a cigar-choking bluesman croaking over the hip-hop syncopation of “Madagascar,” which keeps settling into a chilled co-production taking its cues from P. Diddy and Jay-Z before Guns’ arsenal of axemen jerk the melody back into Queen territory. The song’s sample-heavy bridge is a weird, Queensryche-like soundbite collage drawn from Martin Luther King, Michael J. Fox, the warden from “Cool Hand Luke” and others. Anyone who thinks the hyper-aggressive tone of much of “Chinese Democracy” has steered Rose to forsake his infamous piano, let’s remember that this is still the guy who conceived of “November Rain,” the ’90s gift to sappy self-indulgence. Unfortunately, Axl the screechy balladeer reemerges on couple of times on the new disc and makes an already ridiculous situation sillier still. I can’t sit through the laughable, Elton John power ballad “Street Of Dreams” or its string-laden, even cornier cousin “This Is Love” for more than a few minutes and Rose can spend 15 years crafting this crap. Only occasionally do the years of elbow grease appear to pay off. “Better” is a surprisingly effective combination of mainstream rock arrangements with the punchier, industrial affectations that so intrigued Rose that all the old band’s blues wannabes hung up their axes in frustration. The track starts off like it’s an ordinary, catch-your-breath ditty after listeners have heard the big single, but anything beyond a cursory listen will reveal one of Rose’s more dynamic vocal deliveries. Musically, the song has a number of surprising twists and turns and shred-heavy interludes to show that after 15 years of effort, any song can be worked into a fun listen. Taken in totality, it’s hard not to see in “Chinese Democracy” the parallels that exist between Rose and Charles Foster Kane in Orson Welles’ “Citizen Kane.” Like Kane’s populist rhetoric, Rose was once the rebel seeking to upset any kind of authority. And like Kane, as Rose has grown older and richer, he’ll tolerate none but his own ideas of this band. He does what we wants, no matter the cost. He never did, but as is always the case with Rose, if we put his circus act aside, the question always comes back to whether the music compensates for the sideshow. The answer is no. In all that time he had to contemplate and strategize where he wanted Guns N’ Roses to go, he never factored in his own songwriting limitations. As he multitasks as singer, composer and visionary, his talents drown in a complicated mess. He accomplished his goal of transforming the group, but what he’s made them into is a heavy metal cautionary tale. Tags: "Chinese Democracy", Axl Rose, Guns N' Roses, review. Bookmark the permalink.